There’s nothing to rival the taste of fruit which you’ve grown yourself, but for many of us garden space can be a bit limited, making it difficult to enjoy all the varieties that we might want to have. Fortunately a large number of fruits will do very well in pots, containers and even hanging baskets – so with a little bit of careful planning, it should be possible to accommodate those extra few plants, after all. For generations of gardeners, soft fruits formed the mainstay of container growing and today they remain ideal candidates for even the smallest of plots, with traditional gooseberries, strawberries and raspberries being joined by a number of other varieties and hybrids. Gooseberries are particularly easy to grow and are one of the first fruits to be ready, making them well worth considering. They make few demands beyond keeping them well watered after planting until they become properly established and supplying them with fertiliser or well-rotted manure – though it may be necessary to net them if the birds show too much of an interest in the ripening fruit. Strawberries – almost synonymous with a British summer – also have surprisingly modest needs. 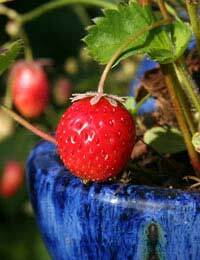 They can be grown either singly in 4-inch (10cm) pots, or in a purpose designed strawberry-pot, which has a series of moulded planting pockets around its sides. Many fruit trees also lend themselves to being grown in pots or containers – particularly the fairly newly developed dwarf varieties which have been specially crafted to suit patios and small spaces. Genetically dwarf forms of apples, pears, nectarines and peaches will all crop very successfully in pots or half barrels with a diameter of 12 inches (30cm) or more – though cherries are probably best planted into 16 or 18 inch (40-45cm) containers. Although hanging baskets are most usually thought of as decorative, they can provide surprisingly good growing conditions for some kinds of fruit – particularly tumbling tomatoes. The seeds need to be planted in April or May, initially either in a seed tray or individually in pots, before being transplanted to your hanging basket once the risk of frost has passed. Varieties such as Tumbler F1, Tumbling Tom Red and Micro Tom are ideal, providing a bumper crop of sweet-tasting, cherry-sized tomatoes. Fruits in containers need more regular attention than their open ground counterparts, particularly when watering and fertilising, since their roots are obviously more contained and prone to drying out. A soil-based compost – John Innes No 3 – is an ideal growing medium giving the roots sufficient room to grow, while adding stability to the pot. Alternatively, you can make up your own mixture of one third perlite or grit to two-thirds multi-purpose compost. The choice of the container itself is also an important factor – the weight of clay pots, for example, makes them stable, but they are quicker to dry out than plastic. In the end it largely comes down to personal preference – but an awareness of their characteristics ahead of time can make life a lot simpler. Container grown fruit trees make a few demands of their own. To avoid the possibility of your plants becoming pot-bound, it is worth re-potting them annually – or at least every two years – in the late autumn or winter, after the leaves have fallen, until the tree has attained full size. Once it is in its final container, root pruning every two or three years and replacing a third of the compost will keep the plant in top condition and ensure the fruit keeps coming. With early-flowering fruit trees, such as peaches or nectarines, being able to move them in or out of cover to avoid possible frosts and provide ideal temperatures can also be a useful way to ensure the best possible growing conditions – and the best possible crop. You certainly don’t have to have a huge garden to be able to grow fruit – and it isn’t a particularly difficult job either, even if the only space available is a container. Pick a sheltered spot in the garden that gets six or more hours of summer sun, make sure they get enough water and the occasional feed and you should soon be enjoying the unbeatable taste of your very own fruit. hello,whats the best way to store and transport strawberries from the farm to the consumer in a region that the temp can go as high has 25 to 35 degree. Best packaging methods pls. I have had lots of demands from lagos nigeria and the farm is in jos Nigeria. The problems I had was packaging the produce to avoid heat damages. This is a brilliant article and I've realised I've put the wrong type of tomatoes in my hanging basket. Nevermind, there's always next year. An article on growing indoors would be really useful. I only have two Juliet balconies, but would love to grow some more.